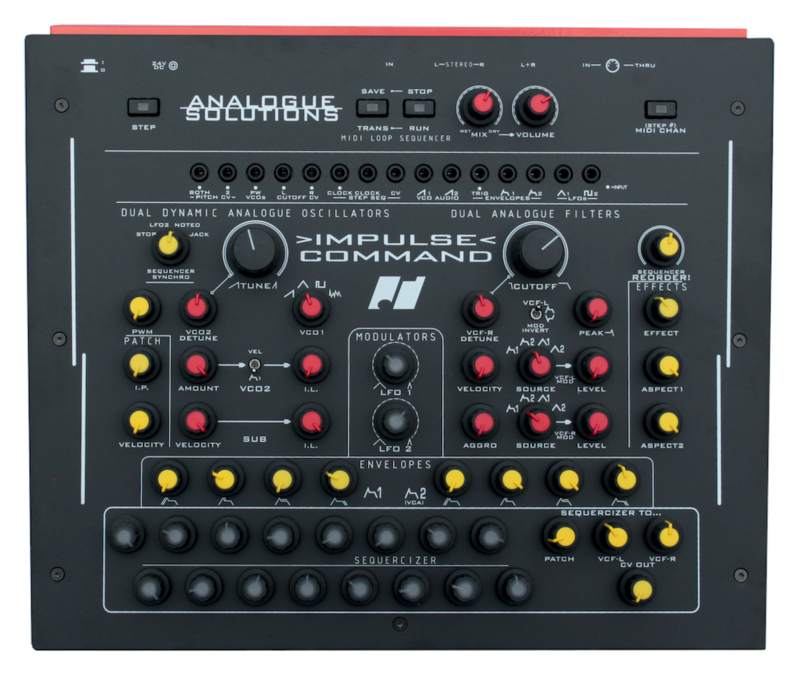 As is, indeed, the case with all Analogue Solutions’ innovative instruments,Impulse Command is a ‘real’ analogue affair... as in its audio signal path — post effects apart — and all modulation routings really are analogue through and through. The chosen company name gives the genuine game away. After all,Analogue Solutions’ circuitry capitalizes on superlative-sounding designs dating back to the Seventies, so no quantisation for CPU (Central Processing Unit) reading required. The VCOs (Voltage Controlled Oscillators), VCFs (Voltage Controlled Filters), EGs (Envelope Generators), and LFOs (Low Frequency Oscillators) are all truly analogue in the Seventies sense of the word, with transistors, op-amps, and resistors. Reality dictates, therefore, that — apart from the MIDI (Musical Instrument Digital Interface) conversion, sequencer control, and digital delay/reverb essential elements —Impulse Command is really analogue. As such, sound benefits become apparent as soon as anyone feasts their ears on the remarkable result. Is it any wonder, then, that there is so much favourable commentary about how good Analogue Solutions’ synthesizers sound! So potential purchasers can clearly take it as ‘red’ — pun intended, given its eye-catching colour scheme! — that Impulse Command sounds as good as analogue gets. Given that Impulse Command is designed by Analogue Solutions founder Tom Carpenter, this surely shouldn’t come as as surprise. 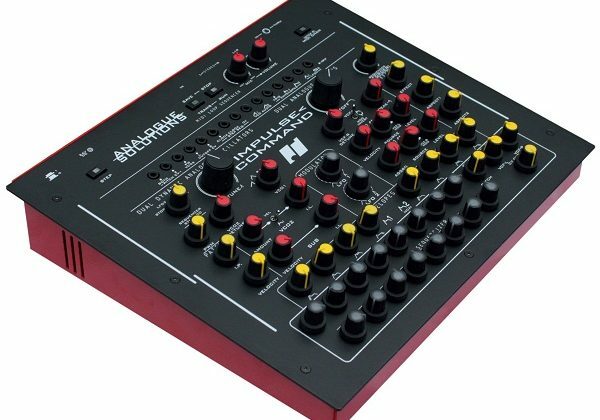 As a fervent fan of electronic music and also an active electronic musician himself, he naturally knows a thing or two about programming synthesizers. So his current creation clearly wasn’t the result of engineering design decisions driven by a steering committee of men (or women) in suits, compulsorily constrained to maximize profit for faceless shareholders. Far from it, in fact. Fortunately for all, the fanciful features available and resultant range of tones they can capably produce have all been carefully thought through to impart Impulse Commandwith what’s required to speedily bring about a wide range of sounds that true analogue admirers could conceivably call for — from huge basses, synth leads, percussion, and effects through to modular system-like stylings. So what makes this superlative-sounding, Seventies-inspired innovative instrument truly tick? The subtractive synthesis signal path in Impulse Command creatively gets going with two VCOs, producing the raw audio sound source for later processing. Providing a wealth of features and modulation choices in and of themselves,VCO1 boasts a white noise generator alongside sawtooth and triangle waveforms, while VCO2 DETUNE does just that — detuning VCO2 to thicken up the resulting synth sound. Thereafter, things start to take a turn towards the fanciful with AMOUNT applying the amount of MIDIVEL(velocity) or EG2 signal that will be applied to modulate VCO2’s volume, selected via a toggle switch, while I.L. manually sets the initial level of VCO2 volume, and allows that level to be dynamically controlled when set to zero; speaking of oscillators, the VELOCITY control sets the amount of MIDI velocity that will be applied to the square wave-equippedSUB(sub-oscillator) volume, while I.L. manually sets the initial level of SUB volume, so also allows that level to be dynamically controlled when set to zero — hence the DUAL DYNAMIC ANALOGUE OSCILLATOR Swording boldly blazoned across Impulse Command’s easy-to-follow front panel! Pitch modulation, meanwhile, such as vibrato or a pitch sweep, can be obtained by patching with cables using the mini-jack sockets sited along the top of the front panel. Put it this way: while Impulse Command is mostly pre-patched, it has such a wide range of modulation routing possibilities that it is almost as versatile as a full modular system and is capable of producing the same types of sounds — albeit without the mess and confusion of cables. 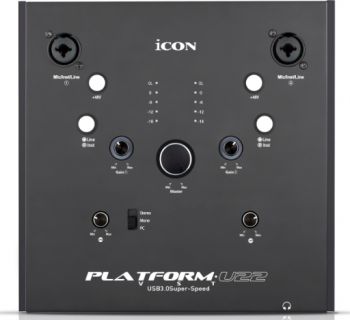 It does, however, have a sizeable selection of patch sockets that allow adventurous users to re-patch it or connect it to an external modular system. So what about that DUAL ANALOGUE FILTERING wording? 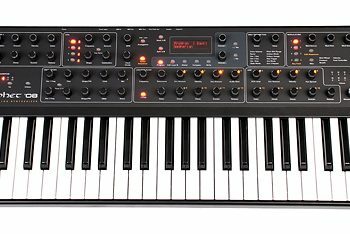 Well, as implied,Impulse Command comes complete with two CEM chip-style filters — the same type as those used in classic synths such as the Elka Synthex, Fairlight CMI, Oberheim OB8, and Sequential Circuits Prophet-5, to name but a notable few. Despite sharing the same core circuitry as those vintage classics, Impulse Command is imbued with its own sonic character, rather than simply sounding like them. Many of the controls are duplicated for each of those 24dB/octave filters. The upper VCF is called VCF-L(left) and the signal — following its own dedicated VCA — is routed to the left output jack. It stands to reason, then, that the lower VCF is called VCF-R(right) and the signal — following its own dedicated VCA — is routed to the right output jack. Commonly,CUTOFF sets the master frequency cutoff for both filters, while PEAK sets the resonance/feedback level of both filters. Further left field, perhaps,VCF-R DETUNE offsets the second filter’s frequency cutoff, while VELOCITY sets the amount of MIDI velocity that will modulate the cutoff of both filters, and AGGRO adds cross modulation from VCO2 to the filter CUTOFF, creating a more edgy sound — increasing PEAK to higher levels emphasises this effect. Elsewhere, there are no fewer than four modulation sources — namely, EG1, EG2, LFO1, and LFO2, while LEVEL sets the level of modulation applied to the filter CUTOFF. 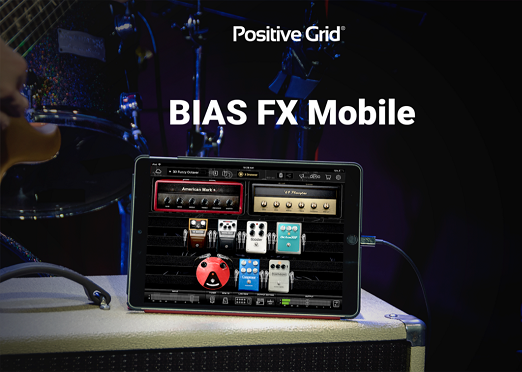 Creatively, MOD INVERT inverts the modulation forVCF-L, which, as an example, enables pseudo-auto-pan effects. External sound sources, such as vocals, guitars, mixer sends, and samplers, etc, can be sent through the filters for further treatment by simply plugging the sound source into the rearside IN(input) socket. All in all, a flexible filtering section that belies this relatively diminutive desktop device’s space-saving (322 x 270mm) footprint. Following on from filtering,Impulse Command’s signal path arrives at two separate analogue ADSR envelopes. EG2 is hardwired to control the VCAs that follow the VCFs, but both EGs are available for modulation of various circuits and have trigger and signal output jacks for further patching. Processing plays a part in Impulse Command’s musical makeup. Primarily designed as a powerful analogue synthesizer, some essential effects — bit crush, delay, flanger, and reverb — have been included to give the resulting sound some ambience. The latter three effects can even be modulated to a degree by the STEP SEQ(sequencer), so they can be dynamically controlled! 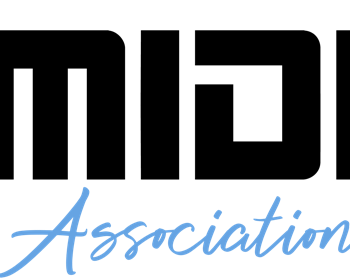 Control-wise, turning EFFECT selects the eight presets, while ASPECT 1 and ASPECT 2 are used to make some adjustments to the sound space preset selected. 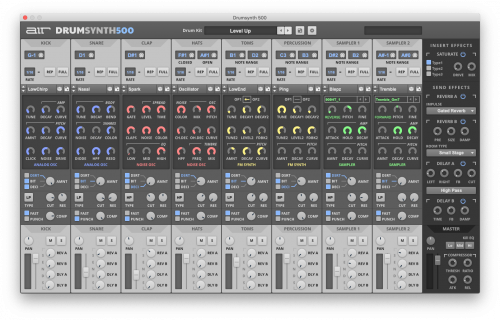 Sequencing is where the sounding-like-several-synthesizers-simultaneously-playing-Impulse Command can come into its own like no other, though. There are two sequencers — an analogue STEP SEQ(that produces voltages) and a MIDI LOOP SEQUENCER(that produces MIDI note loops). Both are clocked from the same signal source, selected using the SEQUENCER SYNCHRO switch, though the MIDI LOOP SEQUENCER can be independently stopped and started. As implied by name, the MIDI LOOP SEQUENCER is used to record melodic loops and will always run in time with the analogue STEP SEQ, which is primarily used for modulation. But both benefit from the radical REORDER!function that affects the sequencer stepping order — forwards, backwards, and all sorts of strange yet wonderful variations! It’s a lot like life, even. 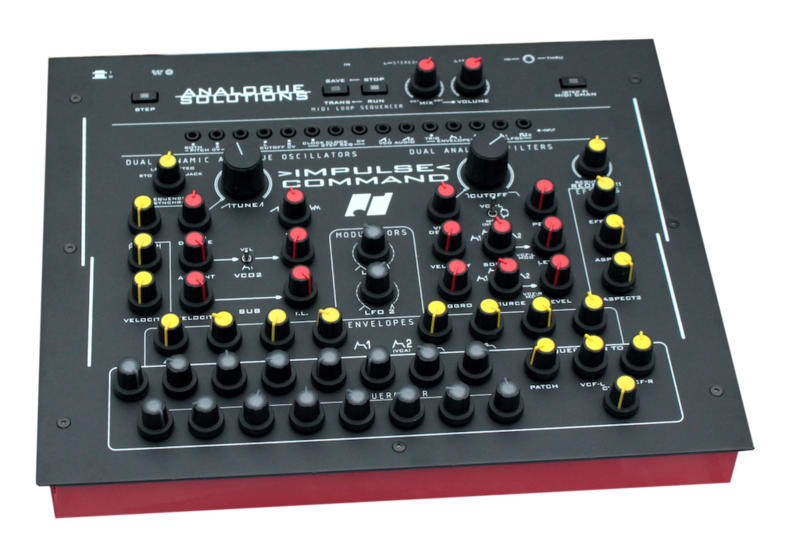 Impulse Command is now available for purchase — priced at an RRP of £849.00 GBP (ex. 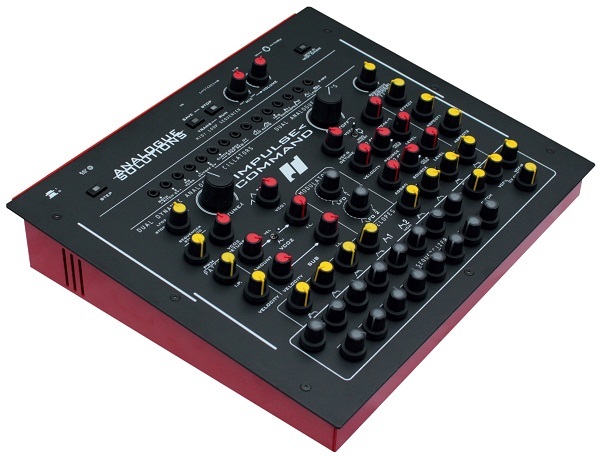 VAT)/€1,179.00 EUR (inc. tax)/ $1,199.00 USD (inc. tax) — through Analogue Solutions’ growing global network of authorised dealers (http://www.analoguesolutions.com/dealers/) or order online directly from Analogue Solutions via the dedicated Impulse Command webpage (http://www.analoguesolutions.com/impulse-command), which also includes more in-depth information.